Christian Hosoi stared down from the top of the concrete pipe, calculating his odds. If he made it down on his board, which would be traveling roughly 100 miles an hour from that angle, would his 45-year-old body swing him around the bottom in time to launch out in one spectacular piece or would he end up roadkill in the parking lot? The largely 25-and-under crowd chided, “The old Christian would do it,” and the guy known for pulling aerials so large they held a world record didn’t take offense. “I am scared,” he said between confidence-seeking fist bumps. Kids as young as 6 showed him the way, filing off the top, their helmets making them look like gumballs rolling out of a maze dispenser. The crowd moved with Hosoi as he surveyed the 13,000-square-foot park, with its coveted 16-foot roll-in with handrails, the first of its kind to be built in over 25 years west of the Mississippi. He paced, and considered a forfeit. Then, he dropped down in prayer. “You knew that was coming,” shouted a bystander playfully. “Yeah, but this time I mean it,” Hosoi replied with a mischievous grin. And then, he let go. 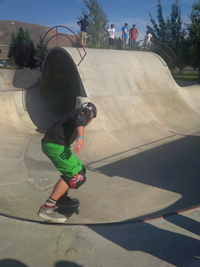 The at-first hushed and then immediately triumphant crowd gathered at the Hailey Skateboard Park for a competition in his name last weekend roared its approval, overlooking the not-so-graceful landing on the plateau-like bench beneath the rim. In 30 years of legend-making skateboarding, he’d never dropped into a bowl from 16 feet sober, or, as it turned out to everyone’s surprise, ever, for that matter. The vertical boarder who started around age 7 with veterans such as Shogo Kubo and Tony Alva, on a deck made by his father, honed his skills in a California skate park managed by his father, dropped out of school and turned pro at the age of 14. Quickly distinguishing himself with his confident flair and graceful style, he helped revive the sport that had all but flat-lined in the late 70s. Hosoi emerged as one of the top competitors of vertical riding alongside pros such as Steve Caballero, Mike McGill and Lester Kasai, and began a decade of competition against Tony Hawk, who regularly challenged Hosoi for the top spot with his technical ability and difficult tricks. Hosoi’s popularity was enhanced by his off-board persona, which was flamboyant and charismatic. A natural marketer of himself and his products, he was a generous partier with otherworldly stamina. But while he even pulled the shoes off his feet to sign and sate a fan, he was about as grounded as his Christ Air and Rocket Air moves were unearthly. With the escalation in fame, income and travel, so grew his use of marijuana, which he started at around 10, with his dad and his hero skaters. He glided into the world of methamphetamine largely unnoticed until he failed to show up for the X-Games, where he and Hawk were slated for a renewed rivalry. Minor arrests led to a major one in January 2000, when he was caught trying to transport nearly 1.5 pounds of meth from L.A. to Honolulu. He was sentenced to 10 years in prison and served four, and found God in the rock-bottom moment. His entire story was documented in the 2006 film “Rising Son—The Legend of Skateboarder Christian Hosoi,” and his memoir, “Hosoi: My Life as a Skateboarder Junkie Inmate Pastor,” which he hopes to release in paperback so it can be sent to prisoners. In 2013, it is an older, wiser and Christian, Christian Hosoi who was facing down his fears in Hailey, this time with different armor. What once pot and meth did for him, now he says his faith does. “It breaks my heart how many people followed in my footsteps,” the father of four boys said to the crowd he had asked to huddle around him after the competition. “Be careful who you look up to. They may be talented, but their lifestyle is what we should look up to. Hosoi, who got his high school diploma and is now a pastor as well, challenged parents to take back their positions as role models to their kids, to stop endorsing behavior by reflecting it, to not make alcohol a rite of passage, and instead help them feel connected to something greater than themselves. Blaine County Drug Coalition Executive Director Michael David was there with his children. His organization offered to pay for any entrants that couldn’t afford the $10 entry fee. He said he was fascinated with the impact Hosoi was having with his message. Andy Gilbert, snowboard coach for the Sun Valley Ski Education Foundation and skate guru, who emceed the event with a spirit-boosting diplomacy, said his kids have grown up in the sport and never been so enthusiastic as being in Hosoi’s presence. Richard Calcagno said his church had been working on ways to have a positive impact on the valley’s youth, and he saw the skate park as a good meeting point while spending time with his son Luca. He said he experienced reluctance from some as he recruited support for the endeavor, which included a book signing at Iconoclast Books Friday night, and a vigorous sermon on Sunday at Assembly of God. He said the fear for many was that Hosoi would be preaching and that would create an aversion for some. Calcagno said he persevered to be able to show his children an idol who fell from grace but found faith and got a do-over. “I’m proof that your dreams can be resurrected,” Hosoi said at the weekend’s end. “I had the best the world had to offer and I wasn’t happy. I thought if I did enough good things, I would have good karma to cover the bad things. Sin means missing the mark. If God can forgive me, he can forgive anyone. “Screwing up is fine, falling down is fine, as long as you get back up and don’t fall like that again. You get back up and do it better. “When you find God, you get your life’s assignment. I’m here on a divine assignment. To connect in a humanistic way with the generation that’s going to grow up and be city leaders and parents. Traditions change. “Skateboarding is about being gnarly and I speak that language. I’ve been there and this stuff I speak is true. If I were an honest skateboard salesman, no one would question the root of my honesty. I am honest about my life and my faith. I’m transparent. I’m flawed. But I am back living my dreams, in a way that serves more purposefully. The Wood River Assembly of God Church in Hailey paid to have Christian Hosoi come to the valley as a part of their community outreach efforts to youths. Thanks to all who gave their input, please find the thoughtful responses on our Facebook page.